Are Rubio and his allies right? The U.S. is responsible for about one-fifth of the world’s carbon dioxide emissions. That’s a lot of carbon—enough, seemingly, to make reductions worthwhile for their own sake. But the conservatives are right when the say the U.S. is no longer the world's most prodigious producer. That distinction belongs to China. Soon India will also produce more CO2 than the U.S. does. And while our carbon output is falling, at least for now, theirs is rising. Of course, President Obama and his supporters know this. A major goal of establishing new rules for domestic emissions, they say, is to make good on a commitment Obama issued in 2009, prior to international talks about climate change in Copenhagen. At the time, Obama pledged that the U.S. would reduce its greenhouse gas emissions by 17 percent, relative to 2005 levels. If the new EPA rules live up to the hopes of environmental advocates, those rules should nearly guarantee that the U.S. hits it target. Having done that, the theory goes, Obama will have more credibility and leverage in future talks—making possible the kind of broad, long-term global treaty that will be necessary to avert the most severe consequences of climate change. This kind of thinking drives conservatives nuts, because it seems to confirm everything they’ve always thought about Obama—namely, that he’s an elitist tree-hugger who won’t stand up to bullies abroad. (See, for example, this piece by Jonathan Tobin in Commentary.) But there’s at least one good reason to think that the Chinese government is willing to address climate change. It's already doing so. In recent years, the Chinese have imposed fuel mileage and appliance efficiency standards, similar in many respects to those in the U.S. Just this week, officials in Beijing announced that the government would be taking another 5 million aging cars off the nation's road. China has also set up pilot versions of tradable pollution permits—in other words, “cap-and-trade” schemes—for various industries. Officials say they hope to make these nationwide soon. And one reason the Chinese government was so eager to sign that massive new deal with Russia, allowing the import of natural gas, was because it's desperate to find alternatives to coal. "For a long time, opponents [of new regulations] said we'll get hoodwinked, because China won't do anything," says David Doniger, director of the Climate and Clean Air Program at the Natural Resources Defense Council. "That's just not true." China's behavior may seem surprising. It shouldn't. China has a major air pollution problem, causing all kinds of very immediate and very tangible health and economic problems. Efforts to reduce the sources of these noxious particles dovetail naturally with efforts to reduce carbon emissions. (The U.S. began dealing with those pollution issues years ago, which is why it's now focusing more exclusively on climate change.) Chinese officials are also hearing the same thing from their scientists that we are from ours—that, over time, climate change will impose huge costs on society, by increasing the prevalence of natural disasters and threatening coastal areas with rising seas. And while China is a totalitarian nation, the government fears instability—and, these days, poor air quality is generating a lot public discontent and protest. It's true that Chinese officials are wary of acting on their own, or getting tied down by international agreements. 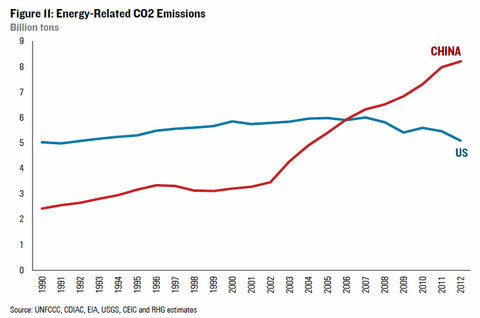 But that makes them no different than their counterparts around the world, including the U.S. And while it's easy to point a finger at China's responsibility for carbon pollution, because it now produces more than the U.S., it's just as easy for the Chinese to point a finger right back, since the U.S. still produces more per person—and was, for a long time, reluctant to act. "What the Chinese care about—what each of the big countries wants to know—is that the other big countries are in the game," says Doniger, who helped negotiate the Kyoto Protocol while serving in the Clinton Administration. "They have the same observation internally as we do. If China acts alone, it makes a difference but doesn't solve the problem. We need all the big players to pitch in."